Want to add a couple of inches to your height? It may seem impossible, but with discipline and dedication it actually is possible to add up to two inches to your height. Even beginning with very simple moves if you are not comfortable with moving straight into a full yoga sequence, it is possible to make a difference. Yoga really does hold the key – the art of stretching, flexibility and relaxing the mind as well as the muscles. If not just for the will to grow taller, the health and muscle gaining and strength benefits of yoga (regular stretching) are huge! – This move is aimed at balancing the spine, releasing any back tension. 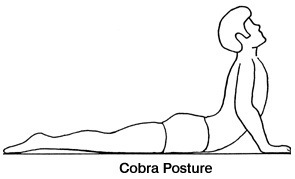 Lying on your back with your chin tucked in, raise your knees to 90 degrees. Allow the knees to fall whilst in complete control as far as comfortably possible and keeping your shoulders in contact with the floor and all times to one side during the exhale. Return to the starting position whilst inhaling and repeat the other side. Each lowering should take around a 4 count and raise up another 2. Perform 10 repetitions on each side before moving on. – This move is aimed at stretching your cartilage disks. On all fours, whilst breathing in, bend the spine – push your torso down toward the ground rotating the hips to push your bum up and out. Breathe in slowly and constantly during this phase. Then slowly exhale whilst pulling your spine up and pulling your stomach in and up towards your spine, tucking your bum underneath you by rotating your hips down. Perform 5 super slow repetitions on this before moving on. – Aimed to strengthen the lower back, and elongate the spine. Perform this stretch by pressing your legs and pelvis into the floor with your hands placed underneath your shoulders. Inhaling, raise your belly and chest off the floor. Then exhale and return to the starting position. Perform 10 repetitions of this before moving on. Perform the sequence three times through every morning upon waking. For the more advanced of you – why not check out the infamous “Sun Salutation and Chakras” for a full body stretch, back lengthening and height increasing amazing morning wake up.